We've officially hit the airwaves! ESOP Partners recently made its radio debut on WTAQ 1360 AM * 97.5 FM in Appleton, WI. Hear Aaron Juckett, President and Founder talk about succession planning, the ESOP option and also address a few common concerns about employee ownership. You will hear our ads through May 26th and again from October 14th to December 22nd. "What is an ESOP?" Click here to listen. "Learn How an ESOP Could Be Part of Your Business Succession Plan." Click here to listen. Not in the Appleton area? Click here to listen live. 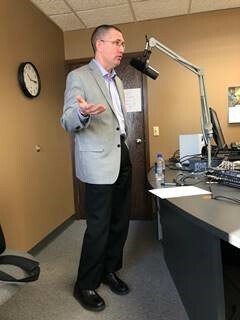 Pictured above: Aaron Juckett "talks employee ownership" and records the radio ads in the WTAQ studio in Appleton, WI.